Charlemagne Palestine (born Chaim Moshe Tzadik Palestine in 1947 in Brooklyn, NY) was a fixture in the New York avant-garde art and music scene of the 1970s. As young artists began to turn away from object-based practices and toward an emphasis on process, gesture, and hybrid forms, Palestine established himself as a musical performance artist. He created works that investigate the body as a sonic instrument and the relationship between sound and emotional or psychological states of being. At a young age, Palestine played drums, piano, and accordion; sang in a synagogue choir; and rang carillon bells at a church. He went on to study at New York University, Columbia University, Mannes College of Music, and California Institute of the Arts. He now lives and works in Europe (specifically Brussels, Belgium), where he has had several solo exhibitions since he moved abroad in the 1980s. Venues include the Centre for Fine Arts (BOZAR), Brussels; Witte de With Center for Contemporary Art, Rotterdam; Kunsthalle Wein, Vienna; Musée des Beaux-Arts, Dole; Musée d’Art Contemporain, Lyon; and Fondation Cartier, Paris. His work also has been included in numerous group exhibitions, including the 39th Venice Biennale, 2014 Whitney Biennial, and Documenta 8. Palestine’s education did not necessarily foretell the direction in which he would take his art, yet in many formal ways, he drew from these past experiences. He became known for ritualistic, immersive compositions based on repeated notes and rhythms. Strumming Music (1974)—a 52-minute piano piece based on Palestine’s insistent reiteration of a few notes and chords—is one celebrated example. Nonetheless, despite the simplicity and deliberately restricted range of his works—often compared to those of Minimalist composers La Monte Young, Terry Riley, and Phillip Glass—Palestine calls himself a “maximalist.” This preference may be based on the fullness, extended duration, and intense physicality of his pieces. His maximialist tendencies also can be seen in the staging of his performances. Palestine is known for surrounding himself with teddy bears, which he regards as “divinities” and “shamanistic representations of the soul,” as he plays the piano. He also has incorporated the bears and other plush toys in elaborate installations, in which they cover the floors and walls, hang from the ceilings, and sit on pedestals. I don’t like the word music by itself. It has nothing to do with me. I’m sure there are musicians, and I have met some of them, and there have been musicians for centuries, but they are not me. Sometimes I enter a world where sounds do things that could resemble music, but again I prefer curiosity: I move. I groove. I sit. I fall. I sing. I sming. I ring. I ding. I flip. I flop. I schmip. I schmup. In these ways, Palestine brings inner drama to the surface. Indeed, wails, chants, screams, and other enactments of release became the focus of his early incursions into video. For Island Song (1976), he attached a video camera to himself to record his ride around an island on a motorcycle. 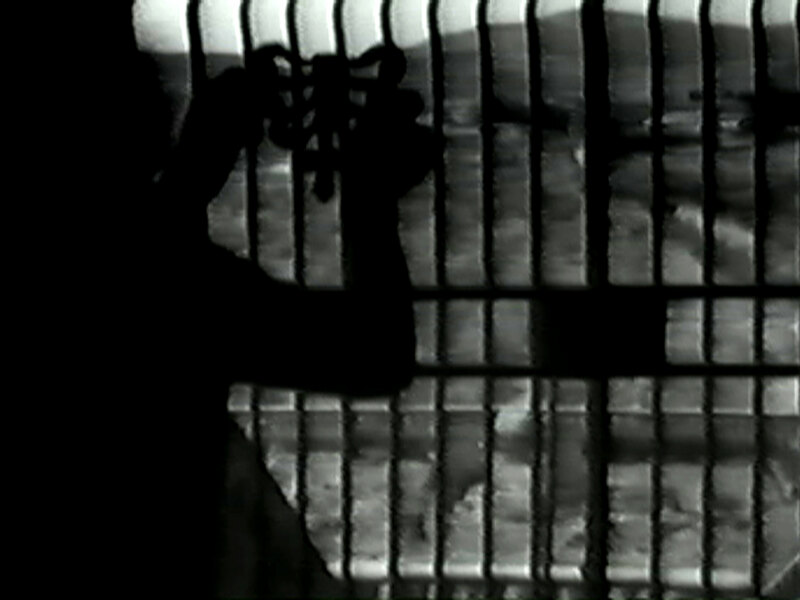 He accompanied the jarring motion of the camera with maniacal howls and chants, such as “Gotta get outta here… gotta get outta here….” In so doing, Palestine’s psychological state and desire for escape becomes more than a phrase: it generates a physical intensity underscored by the vibrations of the motor and camera. Likewise, Internal Tantrum (1974) becomes externalized. Palestine sits before the camera in a tight shot with a tense expression on his face. He slowly chants a single tone and his body rocks back and forth in an aural and physical emission of pain. Palestine says the work conveys “a certain kind of emotional internal roller coaster or earthquake. I used only one tone so the deliverance of energy becomes directly articulated in the sound." Body Music I (1973) and Body Music II (1974), Palestine’s earliest video works, also exemplify his vigorously muscular, physically demanding, and often reckless practice as a body and sound artist. Body Music I begins with a view of his trademark teddy bear, then with Palestine seated on the floor as he persistently intones to generate energy. His body rocks, bounces, and bangs on the floor, appearing about to erupt. Palestine then rises to his feet and continues to drone as he shakes and slowly walks around the room. He eventually runs and slams his body into walls in a seeming attempt to break out of the space. As he has explained, the piece is "a study in the vocal-physical responses of a species caught in an enclosed square room."